Breathing is as natural as, well, breathing. Unless, of course, you have a cold or some variation on asthma, or sticking your head out the window of a fast-moving vehicle . . . . If I am breathing it means I am alive. With each inhalation oxygen fills my lungs to maintain my body’s metabolism. As I exhale, the breath removes the byproduct of the metabolic processes in the form of carbon dioxide. 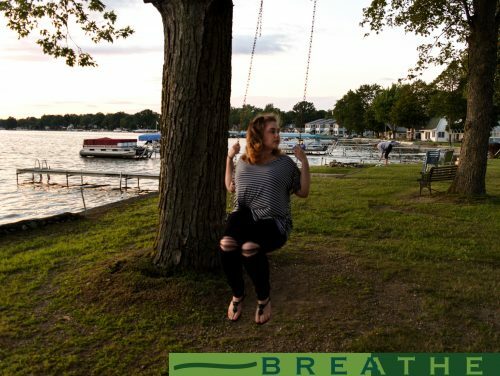 Breathing also plays a significant role in physiological and psychological regulation. It affects my ability to walk or lift my arms or move my fingers across a keyboard. The efficiency with which my breathing operates regulates the plasticity of neurological function – that is, healthy, unrestricted breathing helps me process thought and emotions well. I do no think it is an accident that the Hebrew word for breath, ruach, is also the word for Spirit. So, because breathing is foundational to any mindfulness practice, this first exercise will be about noticing how we breathe. And since a primary objective for this podcast is to bring the spiritual back into the practice, I will incorporate reference to the Spirit of God. Parker Palmer writes, “Breathe in my life, breathe out my gratitude.” Generosity of spirit is life-giving. I do not know what this looks like exactly. It certainly has as many variations as there are unique individuals. I do know it requires space and time—to know who I am most truly amid the suffering, the joy, the pain and delight—so I am enabled (with time) to recognize those same in others. It is a commitment. It is action. It is love. God breathed. Life happened. It is beautiful. It is good. You may wish to revisit this episode several times before moving on to the next, or following one or two episodes. Do whatever you need to make this a habit. My challenge then, is that you follow my direction here now, and continue to practice mindful breathing throughout the day – pick a reminder place-marker (washing hands, opening the car door/house door, putting shoes on) an action you are already doing everyday, and be mindful in that action by paying attention to your breathing. I will lead you in a basic technique to try today and we will revisit breathing tomorrow with another technique. I have heard this way of breathing called “square breathing” because the count is: in 4 and 4 is the count out. So, begin in your space whether sitting, standing or lying down, be comfortable yet alert, calm while attentive. With mouth closed (unless you’re congested, then leave lips slightly open), slowly breathe in: 1 – 2 – 3 – 4 – and hold for 2: 1 – 2 and exhale at the same rate: 1 – 2 – 3 – 4 and hold for 2: 1 – 2. Again. Breathe in the life giving oxygen, clearing your head; breathe out the toxins generated by the stress of the day. Again. Breathe in God’s presence into your being, hold 2, breathe out the remnants of that hurtful remark by another today. Breathe in the joy God has that you are, you exist. Breathe out those ideas that you are alone in all of this. Breathe in knowing that countless others breathe the same air. Breathe out in gratitude for life-giving breath. Continue, at your own pace. Do not rush, do not push. Be gentle with your breath. Notice. You may continue practicing this mindful breathing, perhaps in a prayer, even after you turn off this podcast. Remember to choose a place marker to evoke mindful attention to your breathing. And today, may you walk at the pace of grace.